The Versoix bridge was refurbished and enlarged to accommodate an additional security lane. This required the strengthening of the supporting beams. The selected construction techniques was based on the creation of a new structure perfectly monolithic the existing one creating problems of differential shrinkage. To monitor the behavior of the bridge during the works and in the long term, it was decided to instrument it with more than 100 sensors allowing the measurement of the curvatures at 13 different sections and the calculation of the bridge’s horizontal and vertical deformations by double integration of the curvatures. Sensors pairs were also used to verify the adherence between old and new concrete. 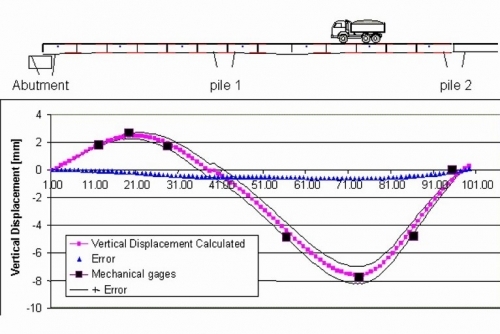 The measurements in fresh concrete allowed the prediction of cracking long before the cracks became visible and the optimization of the concrete mix for successive pours. The sensor pairs confirmed the excellent adherence between the old and new concrete. The single sensors were used to follow the long-term shrinkage of concrete and the seasonal deformations due to temperature changes. 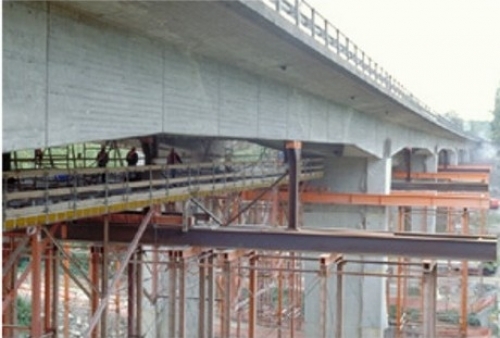 Since more concrete was added on one side of the bridge that on the other, the differential shrinkage tends to bend the bridge horizontally. This behavior was actually observed in the first few months after pouring the new overhangs. The total lateral deformation was of about 5 mm for the first two spans. During a static load test, the vertical displacement was measured by double integration of the curvatures. Excellent agreement with the direct measurements performed with dial gages is found. The figure presents a comparison between the results of the dial gages (dots) and the deformation obtained with the SOFO® system with a load at the center of the second span. The precision in the vertical deformation was estimated to 0.1 mm over 100 m (first and second span).